Presenting my newest puff quilt pattern! I call it Puffy Island because all the little puffs with the flat white sashing in between remind me of little desert islands in the ocean. 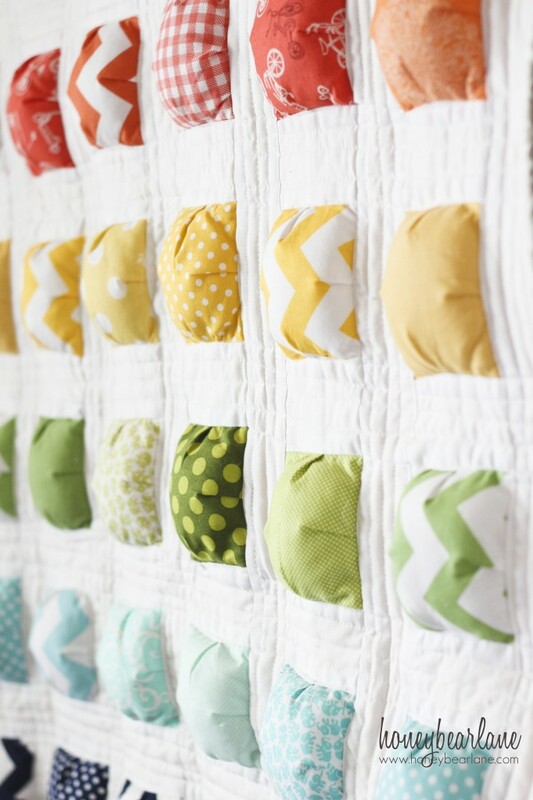 This puff quilt is a mixture of puffs and traditional flat quilting–the best of both worlds! 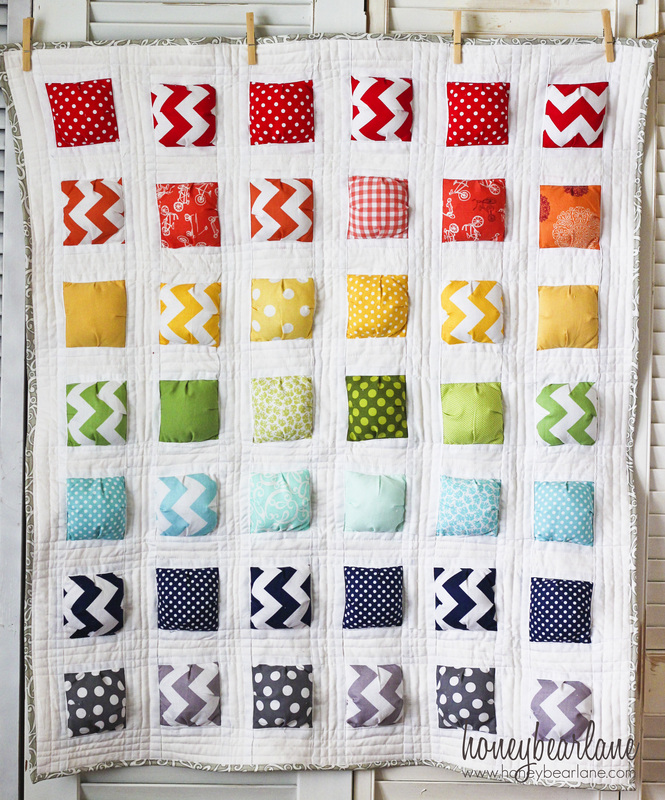 I chose a rainbow ombre scheme for this quilt because lets face it…it’s super cute. I’ve always loved the rainbow array of colors and I’ve got a few projects coming up that use that scheme as well. This quilt is actually pretty easy and comes together quickly. The quilting itself isn’t that difficult either, since it’s just straight lines and I use a walking foot to complete that part. This quilt pattern is great for beginners and advanced alike. And I know that you will want to try it because you will be drawn to the colors…like a moth to a flame, hahaha! This quilt is a great scrap buster and is charm pack friendly. How cute would it be to do this pattern in all white puffs and colored sashing?? Oh man now I want to make another one. The pattern includes 19 pages of full color pictures with 41 steps, like a tutorial. And it includes calculations for making larger sizes. Intimidated by the binding? There are very detailed instructions on doing a binding. But if you want to try your luck, you can enter to win this giveaway! I’m giving away 10 patterns right here, right now! Enter the Rafflecopter below! This quilt looks like so much fun to make! I’d definitely make one for my grandson who is always looking for the best blanket to snuggle under!! I would make one for my niece – – so so cute!! Love it !!! And love the rainbow colors too !! !If I win I will make one for my 2 years old girl ! I’d make one for my son! I just love these puffy quilts! I’m expecting so I would make it for my little peanut. Adorable pattern. I have two nieces or nephews on the way. I would make one for them. This would be the perfect project for the newest baby on the way in our family!! Love this pattern…would make for a baby gift for my nephew and his wife. I love it!!! It’s soooo cute! I would love to win this pattern and I would totally make one to keep! Thanks for the giveaway! I’d love to make this for my little one who is due in June. I love the fabric choices that you used! I LOVE this!! One of my best friends due this spring and I’d LOVE to make this for her!! It’s beautiful and I love the fabric colors you choose! I would make this for my new little man- 2 months old today! This is so cool! You are so creative! I would make this quilt for my boys!!! I have wanted to make a puff quilt for a long time, and this is a great chance. I would keep the first one for me, then make ones for my nieces and nephews! Oh my gosh. I am so in love with the pattern and colors! I’d love to make it for one of my boys, or in some colors to match my living room as a fun throw on the couch! I have several squares left from a quilt my Great Grandmother never got a chance to start. This would make a beautiful quilt. I would love to make it and give it to my grandmother (her daughter!). I would love to make to coordinating ones for my daughter’s. They share a room and these would be lovely in there. I would make one for baby #2! This is so AWESOME! I know my daughter would LOVE this. Might have to be my next project! 🙂 Thanks so much for the chance to win. I think that is beautiful.Id love to be able to give it to a friends friend who has cancer,Shes having chemo these days.Shed love to cuddle with it after her treatments. I have a friend having a little girl in late February who this would be perfect for! Amazing! I would love to try out my new sewing machine on this lovely! I would love to make this for my forth son! I love this quilt. I am just learning to quilt! I have made panel quilts in the past for the little ones at church and probably would do the same with this one. I would love to make this for my daughter….. she loves colorful blankets and I know she would love this one and would love to help me make it. I love the quilt, I would love to see my two little girls snuggled up underneath it. 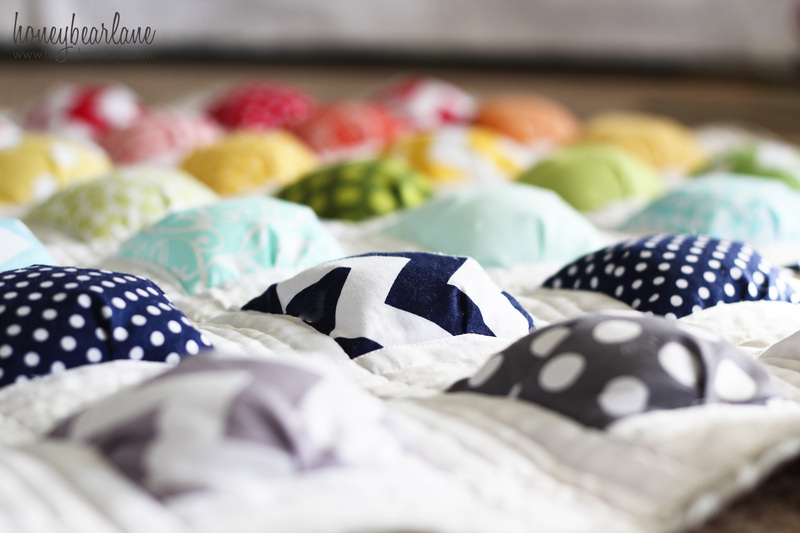 A cousin of mine asked me if i had any ideas on what to do with her 20 some bras that she couldnt use anymore (LARGE BRAS) so i made a puff quilt out of the cups…it looked awesome! It was my 2nd quilt and last quilt i ever made. Oh!!! I am having a little baby in June and this is the PERFECT pattern for a quilt for it!!!! Our new baby! This is so fun and I image comfy too! Thanks for the chance! The quilt is so adorable! It would be great for a child’s room. WOW super cool! its very colorful and fun but looks very comfy! right up my alley! If i wont this pattern it would be my first quilt, ive been wanting to do one but putting it off, this one looks like i could do it. So cute!!! I would love to make one for my nephew! I would make it for my friend who is having a new baby! I wiuld make a quilt for my little guy. I made his sister your basketweave quilt last year he is due! Probably make it for my own baby! And my sister-in-law who’s due in April, if she’s lucky! This is so very pretty!! For our new baby coming this summer! I love this! How creative! I’ve never made a quilt before but this one sure makes me want to try! This would be made for cuddle time with my daughter! I would make it for my friend having a baby in a few months. I bought your rag puff quilt instructions, and I totally love it! This one would be a fun alternative! I would make this for my friend who loves rainbow everything!!! This is so cute! My mom is picking up quilting, and this would be a great project for her! Love! I would make it for my two kids. They would totally love it too! I would make this for a friend who’s having a baby! Bright colors, polka dots, stripes OH My. A beautiful rainbow of happiness right there, that is for sure. Who would I make this quilt for? My boys would love a new blanket for their beds (I guess that means I would have to make two). The colors and patterns are so fun! I would make this quilt for me first, then maybe my sisters, but they would probably want to make their own! The quilt is so cute. It would look so cute in my daughters room. I love this quilt! I would make it for our baby that is due this summer!! I love this! The FIRST person I would make this for is our daughter who will be leaving for college next year. Her life revolves around music and musicals. I’d love to do this in music themed fabric for her! Then I would poceed to make one for everyone in our house! I would LOVE to make this for myself. And once I knew I could, I would make matching boy-colored ones for my boys’ room. They are about to room together and those would be GREAT! I’d make one for each of my kids! Wow! I’ve never see a quilt like this before! So fun! I would love to make it for my 2 year old son & another baby that’s on it’s way in June. I also think this would be a great gift to make for all my nieces & nephews! this would make a great bedspread for my daughter’s little girl room. I love your quilts! and I even have the tutorial and it SI SO easy! But hey, if I can get one already made… C: Thanks! I would make it for me HA!! My daughter is expecting her first baby and this would be such a perfect gift for her! My fingers are crossed!!! Who would I NOT make it for? So cute. I would make it for my new niece in South Carolina. there is NO WAY i could possibly make this quilt…that is why I NEED TO WIN IT!!!!! I love this one. I’m a sucker for anything with rainbows. Who are we kidding, I’d make this quilt for me! Love it! I would make it for our baby that’s due on June 14th – this would be a fun addition to the nursery! I would make this for my best friend! 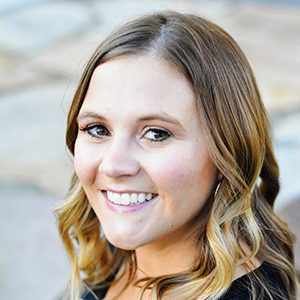 she just had baby number 5 and really needs something Brand new for her new baby! I’d probably make it for myself. It’s so cute! I would make it for the baby I just found out I’m expecting! Darling!! I would make one for Baby J coming in February! I would make one for each of my three children! My 1 year old son! So super cute! i live the simplicity & color possibities. Great job on another wonderful quilt. Thanks for the chance. Smiles-Beth. Oops, I left a comment before knowing what your question is…I would be totally selfish and make this quilt for our family. It’s one of my goals in 2013 to make more things for my boys :). Thanks again for the chance. I would so make this quilt for my living room!! So cute!!!!! That quilt is super cute! I’d love to win the pattern! I’d make it for myself! I love your quilts, and this one is C U T E! Love the patterns! This would be great for my 15 month old niece. I love this quilt! I would love to make my daughter one! Would definitely make it for my little girls room. She’s two and loves her “gankets” (blankets). This is gorgeous! I’m so intrigued by puff quilts! So cute! I would do this with old baby clothes!! I love this pattern and would love to make a baby quilt for my friend having a little boy! Beautiful! The colors really make it stand out as awesome. Pregnant and due in June – would be a great first baby quilt for my little one! I would love to make this as a seek & find quilt for my grandkids. How fun would that be?! I am new at making quilts abd this is the perfect pattern to try. I love it. I WOULD MAKE IT FOR MY GIRLS….ONE PER CHILD. LOL. SO I GUESS I WOULD MAKE TWO OF THEM. I would love to give it to my 1 yr old daughter. So cute! I have ALWAYS wanted to learn how to quilt. This pattern might be the one to finally motivate me to finally do it. I would make it for my daughter who is about to turn one! How adorable! I would love to make this for baby #2! Thanks for having a giveaway! I would make this for my Granddaughter, she would love it! very cute! I would make one for my baby girl. Although – she isn’t a baby anymore, but I still like to call her that!! I would make this quilt for a friend who is expecting her first child after six long years of a battle with infertility. I’d also work on one for when my husband and I finally start our own family! I would SO make this for my new GranGurl coming in a coupla weeks!!! I love the colors of this quilt! I love this pattern and I would make this quilt for my Grandma because she always made quilts for us as kids and now that her eye sight is failing and she can’t make them anymore I want to give her the same gift and feeling that she always gave us. I would make this for my best friend who just had her sweet baby last week! Hi, I don’t have my own website, but I would love to win this. I would make one each of these quilts for each of my daughters. I never tried to quild, but this looks like maybe I could make it. My grandbaby needs a beauty like this. I’d love to make this for my son!! He’s 2 and would love it! My mom and I pinky promised that we would get back to quilting this year. This would be a great place to start! This would be a ‘house’ quilt for the Grandchildren to use when they came to visit us. I would make one as a play blanket for my boys. I am planning to make a weighted blanket quilt for my 2 1/2 year old grandaughter who is on the autism spectrum. They are touted as being theraputic and yet how cool it would be to have one that is pretty, too! And the little puffs could serve double duty and hold the poly beads. I am thinking this is my total solution!! my friend has TWIN babies on the way.. this would be fabulous! 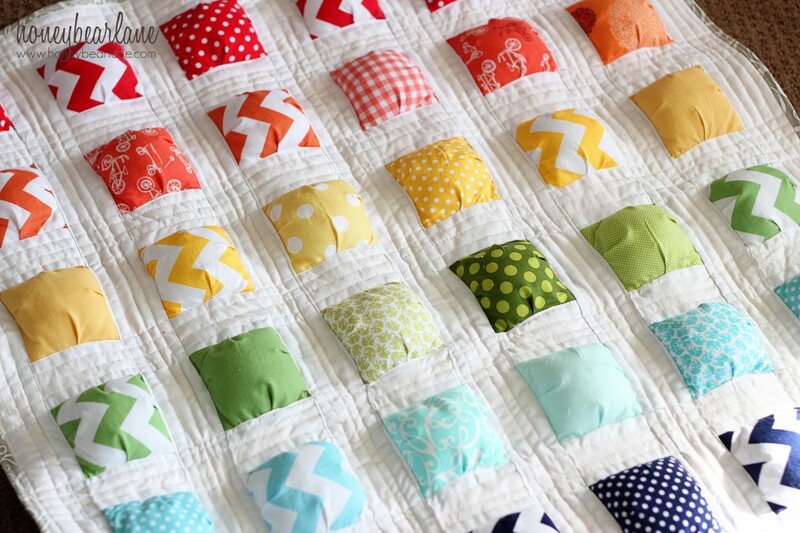 I would love to make this quilt for my new grandbaby! I’d make it for my new baby. I made the rag puff quilt for my oldest and she loves it! So i want the new baby to have their own quilt too. I would make this quilt for my sister!! I would make this for my baby. I would make it for myself! I made my first quilt last year using your puffy quilt tutorial and have been itching to make another one ever since! I’d love to try your new pattern! I’d make this for my grandchild. The fabrics you chose are great! I would make a quilt for me! I LOVE this!! Definitely something I would love to make for our little man’s toddler bed! This quilt is so cute! I would love to make one for my little boy and maybe a few for friends having babies. I’ve been wanting to make puff quilts for my kids bed for at least a year! I would so like to make this quilt for my grandaughter! She loves Puffy!!! This quilt is so cute, I especially love the rainbow ombre scheme. I would like to make one for my daughter, thanks for the chance! I would make this for my niece!! I would need to make a couple of these. My neices would love them! I would make this for my dear friend Paul who is expecting a boy in may! I woud love to win this pattern to make a quilt for my new baby girl who surprised us by arriving 7 weeks early! She is a month old already! I would also make one for the worlds best sister (3 1/2)!! This quilt is so cute! I have never seen one like it before! I would love to make this for my daughter. Super Cute! This would be such a great way to get rid of scraps. Or a good excuse to go buy some new fabric. I love it! OMG! This is AWESOME! I can’t believe you’re giving it away because it’s so neat! I hope I win. This is just adorable! I love the color scheme and the puffs make it so much fun! I’d love to win this pattern! Oh how cute! I LOVE it! I would make this for…who am I kidding…me!! I would make this quilt for my mom! so incredibly cute — what talent. i’d make it for — golly everyone i know if i could. Adorable! I really want to make this for all of my friends who about to have bubbas! I am from Austria and normally I live in the very western part of it, but for my work i have to stay for a long time in a different part, now since already two years. My friend here helped me a lot to be integrated and accepted and gave me a good feeling to be welcome. That’s why I think she deserves a great quilt like yours are. I’ve made a couple of the original puff quilts, and I love them! I would love to try these out too! Love it! I think I would make one for everyone in my family! I would make this quilt for my three year old granddaughter Ariana whom I haven’t seen in a year. I send her home made crafts so she knows where they came from. I can’t wait to see her next month, and I hope to give her this quilt. Just to see the excitement in her eyes. I’m just an old fellow and I wish someone would make me one. Would make great gifts for nieces and nephews children. I would love to buy the pattern for your puff quilt, but do not see anywhere on this site to order it. Please help! !